GRANT STINCHFIELD: The Washington Post is out of line. They claim to uphold the standards of journalism when, in fact, they use their keyboards as weapons of destruction as they try to tear apart the Trump administration in an effort not just to destroy him, but to destroy America, and it is wrong. Following widespread criticism over an inflammatory video from the National Rifle Association that called on supporters to use the “clenched fist of truth” against critics of President Donald Trump, the organization has repeatedly doubled down and issued more statements that falsely conflate dissent against Trump with violence. The organization proceeded to lob smears against Women’s March participants and co-founders after they announced an 18-mile march to protest the NRA on July 14. 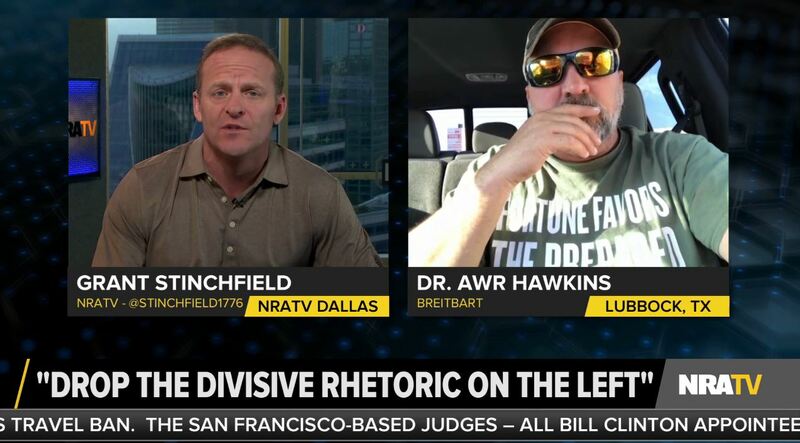 NRATV calls London attack on Muslims a "maybe attack"
GRANT STINCHFIELD (HOST): I was going to first ask you about the maybe attack in London, where again we had a van drive through folks it appears, in front of a mosque. What do you make of early this morning's events? DAN PERKINS: Well it's interesting, it’s 180 degrees from the last one. This attack was civilians on the Muslims. They ran into, right outside of a mosque as people were coming out from the worship services for Ramadan. And the guy was shouting, basically he was saying, "it's our turn, this is for the people [that] you killed earlier.” So he was specifically out after Muslims, not after British citizens, per say. But in retaliation for the recent attacks in London. One guy decided he was going to do something about it, and he ran his van, he killed one person and injured a bunch of others. But it was at a mosque in London. STINCHFIELD: Alright, so we see an escalating number of attacks, as that is still under investigation. And I would like to get more information about what really happened there, as it’s still very early in this investigation. But something just seems odd about the whole thing to me. On June 14, a 66-year-old gunman opened fire on a congressional baseball practice and shot five, including Scalise. The attacker, later identified as James Hodgkinson, was shot at the scene by U.S. Capitol Police and later died from his injuries. A Capitol Hill staffer, a man who helps organize the baseball practice, and two police officers were also shot. GRANT STINCHFIELD (HOST): Look, I want everyone to know that certainly the shooter has accountability in this. He gets the ultimate responsibility for his actions. But when you are unstable, when you are deranged, it only takes a little bit to provoke you to do something. There is culpability for those on the left that push this violent atmosphere against conservatives, against people that don’t believe in what they do. And that’s what’s got to stop. Trump haters push protests past the limit of decency, with media fanning the hateful flames. People like Kathy Griffin and those who produce New York Public Theater’s Shakespeare in the Park series, whose goal is to divide the country, then use the division to their political benefit. Such division births animosity, which grows into hatred that can erupt into the kind of violence we saw when 66-year-old James T. Hodgkinson opened fire on the GOP lawmakers. The left has created a climate in which violence is imminent; the divisions they foster and maintain to be elected to office—or to preserve their Hollywood and media fiefdoms—are coming back to haunt us in real time. Shame on them for exploiting the very violence their ideology births; for seeking to spin a heinous crime into another gun control law. 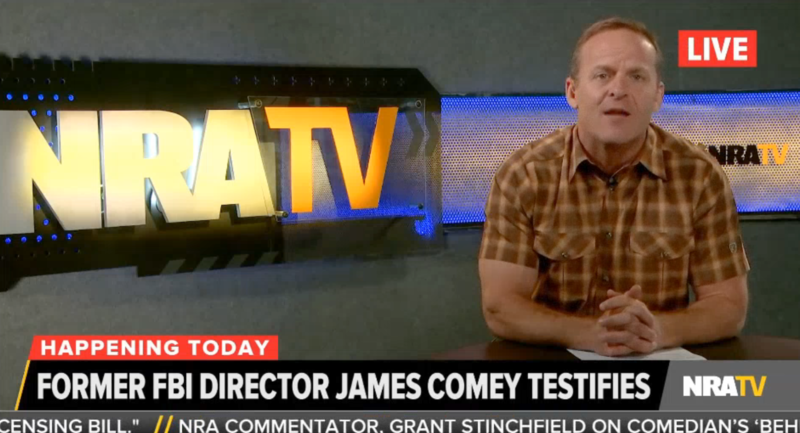 The National Rifle Association’s news outlet NRATV spun former FBI Director James Comey’s testimony to the Senate intelligence committee to President Donald Trump’s advantage by flatly lying about what Comey said. Comey testified in an open hearing before the Senate intelligence committee on June 8, almost a month after Trump abruptly fired him. Trump’s public statements on the firing have caused numerous legal experts to warn that Trump may have obstructed justice by improperly interfering with an FBI investigation. RICHARD BURR: Director, when the president requested that you -- and I quote -- “let Flynn go,” General Flynn had an unreported contact with the Russians, which is an offense and if press accounts are right, there might have been discrepancies between facts and his FBI testimony. In your estimation, was General Flynn at that time in serious legal jeopardy and, in addition to that, do you sense that the president was trying to obstruct justice or just seek for a way for Mike Flynn to save face given he had already been fired? #JamesComey testimony will be a big "Nothing Burger!" But get ready for the media spin! In January, the NRA released a video promising that the group would be “Donald Trump’s strongest, most unflinching ally.” That allegiance apparently extends to fabricating quotes from a public hearing for the benefit of the president. Seven people were killed in London on June 3, after three assailants used a vehicle to run into pedestrians on the London Bridge and then got out of the van to attack other victims with knives in nearby Borough Market. About 50 people were injured before police shot and killed all three suspects. Saturday’s attack came 12 days after a suicide attack at an Ariana Grande concert which left 22 dead, and a little over two months after a March attack in London that left four dead. Covering the Orlando attack would have brought the nonsensical nature of the NRA’s arguments surrounding guns and terrorism into clear focus: The United States has much more permissive gun laws and availability compared to the U.K. and as a consequence experiences much higher rates of gun homicide and homicide generally. Beyond pushing more permissive guns laws, during the 9 a.m. update, Stinchfield said that the government in the United States should “surveil” mosques. During all of NRATV’s June 5 Stinchfield updates, neither Stinchfield nor his guests brought up Monday’s attack in Orlando, which left five people including the gunman dead. NRATV host Cam Edwards mentioned the attack briefly during his three-hour show, but used it to push for more gun ownership. Despite Stinchfield’s repeated claim that the U.K. was unprepared for the attack because the government has “disarmed” its people, the country actually has drastically lower rates of gun homicide and homicide generally compared to the U.S. The U.K. also has much more restrictive gun laws. Academic research has also found that guns are used in the U.S. far more often to commit crimes than to stop crimes. A 2000 study by Harvard Injury Research Control Center found that as a ratio, "guns are used to threaten and intimidate far more often than they are used in self defense. Most self reported self defense gun uses may well be illegal and against the interests of society." In fact, the odds of people needing a gun to protect themselves are so low that it’s difficult to accurately measure the total number of defensive gun uses each year. Meanwhile, gun violence is so frequent in the United States that more than 100,000 gunshot injuries are recorded every year (a figure that does not include crimes committed with guns where no one is shot). In contrast to a lack of evidence that civilians can effectively use guns to stop mass shootings -- a frequent claim that the NRA makes -- terror attacks involving firearms in the United States, which often involve AR-15-style assault weapons, have been incredibly deadly over the years. A December 2015 terror attack in San Bernardino, CA, involved a gunman shooting and killing 14 and wounding 22 with an assault rifle at an office holiday party. The perpetrator of a June 2016 terror attack in a nightclub in Orlando, FL, also used an assault weapon to kill 49 people and wound at least 53. Following an attack in Manchester, England, that left 22 dead and 59 injured, a commentator for the National Rifle Association’s news outlet nonsensically claimed England “has had this coming for a long time” in part because of the country’s gun laws. ISIS claimed responsibility for a suicide bombing at Manchester Arena right after a May 22 Ariana Grande concert. The attack comes after a March terror attack in London near the House of Parliament. GRANT STINCHFIELD (HOST): You bring up this whole point of putting the English flag as a silhouette over your profile on your Facebook page. I’m all for supporting them -- they need our thoughts and prayers right now -- but listen, if the only time they do something like that is when we have a heinous attack, and then we’ll go for a week and they’ll forget all about it. And they take down their little flag and they put their pictures up on the beach and they’re having fun doing whatever, going to the movies, and they forget that there are people that want to kill us. And so I’m a little tired of the hypocrisy from the left and it's almost always the liberal that goes and puts this up on the day of an attack, and then it quickly comes down, and then it just eradicates from their mind like it never happened. CHUCK HOLTON: Because they think that that actually counts as doing something. It doesn't. And you know in reality, England has had this coming for a long time in that they have -- look, they have opened their borders to so many refugees, they have done away with the personal protections, of their own people being able to protect their families with firearms. And so what we’re seeing is, you know what? Terrorists don’t need firearms to perpetrate their heinous crimes. They are weaponizing the European culture. That’s what they’re doing. They are taking advantage of this multiculturalism and the, you know, gender-bending -- we could go on and on about this. The European male is disappearing in Europe -- the actual men who will stand up and fight for their country. You could also talk about the fact that the Europeans need these people to come in to help support their massive social welfare program. Do you know that, I was reading the other day, nine European -- major European leaders now are absolutely childless, and that reflects the broader culture in Europe, that places like Germany, 30 percent of German women have no children and will never have children. In England it’s something like 20 percent, but that’s rising. And so when you’re not making babies, you need people to come in and work and pay taxes to support your massive social welfare programs. So this is, in some ways, this wave of violence that we’re seeing across Europe is a symptom of the broader problem of multiculturalism and socialism. STINCHFIELD: And we are seriously considering sending Chuck Holton over to England to get the real scoop for you, because I can tell you right now, you’re not going to get the real scoop on the mainstream media channels. They’re not going to talk about the immigration problems that Europe experiences. They’re not going to talk about the problem that Europe, all countries, have basically disarmed their communities, disarmed their citizens, so what happens that terrorists operate with impunity. Stinchfield made the same ridiculous claim after four people were killed in the March 22 London attack, suggesting that Europeans are “unprepared for an attack” because “the government has all but disarmed” its citizens. While the U.K. did enact highly restrictive measures on gun ownership after a school shooting in 1996, the European nation also has drastically lower rates of gun deaths, gun homicides, and homicides by all methods compare to America does. In fact, the odds of needing a gun to protect yourself are so low that it’s difficult to accurately measure the total number of defensive gun uses each year. Meanwhile, gun violence is so frequent in the United States that more than 100,000 gunshot injuries are recorded every year (a figure that does not include crimes committed with guns where no one is shot). In contrast to a lack of evidence that civilians can effectively use guns to stop mass shootings -- a frequent claim of the NRA -- terror attacks involving firearms in the United States, which often involve AR-15-style assault weapons, have been incredibly deadly over the years. A December 2015 terror attack in San Bernardino, CA, involved a gunman shooting and killing 14 and wounding 22 with an assault rifle at an office holiday party, and the perpetrator of a June 2016 terror attack in a gay nightclub in Orlando, FL, shot and killed 49 and wounded at least 53, also with an assault rifle. NRATV host Grant Stinchfield erroneously claimed that “anti-gunners out there could weaponize” a new gun violence prevention bill in Nevada in order to get law enforcement to confiscate their neighbors’ legally owned firearms. The legislation in question, a type of protection order that allows temporary removal of firearms from certain “high-risk” individuals, actually allows only household members to file a report requesting the removal. GRANT STINCHFIELD (HOST): All right, so the big issue at hand, we talked last week about this bill that would say that anybody who owns a firearm would be considered high risk. And if you’re considered high risk, anybody makes a complaint about you, the police can come in and take your guns away. Shortly after that interview, they pulled the high-risk component of that bill, for simply being a firearms owner? ROBERT UITHOVEN: Right at the very beginning of the bill -- I mean, there are a lot of things wrong with this bill -- but it defined what a high-risk person is, and it's anyone who owned or possessed a firearm. And we’ve got a lot of those folks here in Nevada, as there are across the country. Just simply by the ownership or possession, you were defined as high risk. The sponsor of the bill, I think at the urging of probably the committee chair, removed that provision. There have been some modifications that have improved the bill, but it is still, in our view, a pre-crime bill. STINCHFIELD: And so due process is what this country is all about. We have a right to keep and bear arms -- if you want to take away one of our freedoms, you’ve got to prove the reason of why you’re going to take away that right. This bill does none of that, but even beyond that, I believe the left and the anti-gunners out there could weaponize this bill to have anti-gun advocates simply go around their neighborhood, know what neighbors own guns, and simply file a complaint against them, and the next thing you know, those guns are being confiscated off the word of an anti-gun zealot. UITHOVEN: That’s true, and even some Democrats -- we had our hearing last week right after we concluded with this interview. Fortunately, we, on this assembly judiciary panel where this hearing was conducted, we even had some Democrats who we believe will be with us on the legislation. In actuality, the bill, which passed the Nevada Senate last week, defined a high-risk individual far more narrowly: As guns.com described it, the term covers “someone who owns a firearm, poses a danger to themselves or others and has threatened violence” within six months “or behaved violently.” The bill also specifies that it is “a family, or household member or law enforcement officer” who can file a “verified application” for an order of protection against the individual -- not “anti-gun advocates” walking around the neighborhood, as Stinchfield suggested. The bill states that any firearm confiscation is temporary, with a hearing to be scheduled for 21 days after the order is issued; it may be extended after the hearing for up to one year. According to Guns.com, an amendment to the bill would add the rule that “those who provide false information” in trying to temporarily remove someone’s firearm would be penalized. The basis of this claim is a distortion of recent news reports about an ISIS magazine piece. The magazine, Rumiyah, urged its followers to buy firearms from private sellers at gun shows and online who, in many states, are not required to perform background checks on their customers. The exhortation by this ISIS magazine echoes similar calls in recent years from Al Qaeda. In 2013, following the Sandy Hook Elementary School massacre, the NRA used falsehoods to orchestrate the defeat of modest federal background check legislation that would have required background checks for all sales at gun shows and over the internet. 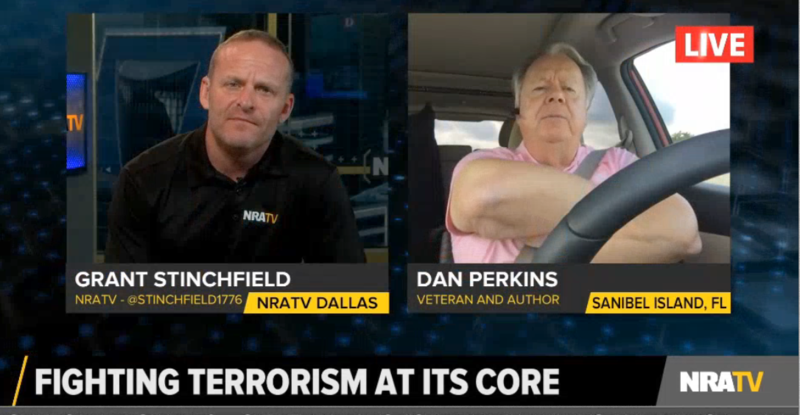 NRATV program Stinchfield, which offers lives news updates at the top of the hour on weekdays, twisted reporting on the ISIS magazine article into a nonsensical conspiracy theory. During a May 12 broadcast, host Grant Stinchfield falsely claimed that “in a recent piece in ISIS’ online magazine, they go all out for gun control” and that “ISIS all but calls for liberals to shut down the so-called gun show loophole.” But the magazine did the opposite. Instead of calling for more gun laws, it called for current gun laws to be exploited. There is another obvious reason Stinchfield’s theory doesn’t make any sense: Closing the “gun show loophole” wouldn’t disarm legal gun owners. “Gun show loophole” legislation instead merely requires that potential gun owners be checked against the background check system to ensure that they are not felons, convicted domestic abusers, or other prohibited persons. Current Supreme Court precedent says the Second Amendment guarantees the right of law-abiding Americans to keep a gun in the home for the purpose of self-defense. The NRA is very sensitive to calls by terror groups to exploit loopholes in gun laws that the NRA fights to keep open. In 2013, an NRA News program smeared BuzzFeed as “approvingly citing Al Qaeda” merely because the site reported on the existence of an Al Qaeda video that called for supporters to exploit loopholes in U.S. gun laws. GRANT STINCHFIELD (HOST): The New York Daily News is a left-wing rag, a tabloid that now takes its cues from not just liberals, but from ISIS. Yes, ISIS is pushing for more gun control in America, yet the Daily News, The New York Times, and The Washington Post are all blinded to see that as they’re being used as terror pawns. Of course ISIS wants gun control. Disarm its enemy, then wage war. In a recent piece in ISIS’ online magazine, they go all out for gun control. ISIS all but calls for liberals to shut down the so-called gun show loophole. How do they do it? By urging ISIS supporters to buy guns at gun shows. ISIS knows the call to do that would freak liberals out. So those liberals would push for more gun control. Now you and I know there is no such thing as a gun show loophole. It’s a scare tactic created by the anti-gunners to limit your rights to keep and bear arms. ISIS issues this calling not just to arm jihadists, but to scare the left into issuing a call for more gun control, and that’s exactly what these liberal papers are now doing. They fell for the terror trap. It’s bias by omission and it’s deception at its worst.